Katowice Airport (Polish: Międzynarodowy Port Lotniczy Katowice) (IATA: KTW, ICAO: EPKT) is an international airport, located in Pyrzowice, 30 km (19 mi) north of Katowice, Poland. The airport has the fourth-biggest passenger flow in Poland. It is also second biggest airport in the Country in Cargo traffic. Katowice Airport operates a lot of charter, regular and cargo flights. The current location of Katowice Airport was initially used by German soldiers. In 1940, the Luftwaffe began construction of an airbase in the meadows around Pyrzowice. The Germans built three stone and concrete airstrips, with runway lengths varying from 1000 to 1500 meters, all of which around 50 meters wide. The airbase was used for handling of military aircraft flying from the inner part of the German Reich, carrying supplies to troops on the Eastern Front. In the final phase of World War II, the Messerschmitt Me 163 Komet rocket-powered aircraft were tested here. Following General Ernst Udet's (a Luftwaffe flying ace) death in 1941, the airfield was named Udetfeld. From 1945 to 1951, Soviet soldiers were stationed at the airbase. In the early 1950s, the Soviets handed the airbase over to the Polish Air Force. It was then used by the 39th Fighter Regiment, created on April 17th, 1951. A new runway was built in 1964. Soon after, the airbase Pyrzowice became host to (first ever) regular passenger traffic, when on the 6th of October 1966, the first plane of LOT Polish Airlines took off for Warsaw. By the end of 1969, a small passenger terminal was built (550 m²), together with a taxiway and an apron. This runway has since been replaced by a new adjacent one, completed in May 2015. In 1991, Górnośląskie Towarzystwo Lotnicze (GTL) (English: Upper Silesian Aviation Group) was created. On March 27th, 1993, the German carrier Lufthansa flew to Frankfurt am Main, thus inaugurating the first international service. Passenger Terminal B officially opened in 2007, followed by (arrivals only) Terminal C, in 2015. Future plans include the construction of a completely new passenger terminal, a further expansion of the recently built cargo terminal, as well as a new railway connection. On the 3 October 2018 the airport celebrated 4 million passengers travelling through Katowice. The airport features three passenger terminals A, B (departures) and C (arrivals) as well as a cargo terminal. Operations at terminal B, much bigger than A, started on 30 July 2007. Terminals are capable of handling about 3.6 million passengers annually. Terminal A handles all non-Schengen departure flights, while Terminal B handles all Schengen departure flights. The operation of the newest Terminal C building (arrivals) started on June 27, 2015. This terminal handles all arrival flights from non-Schengen such as Schengen. The longest airport observation deck in Poland can be found inside Terminal B. New Terminal D is under planning such as new Cargo Terminal and Cargo City. New Terminal D will be equipped with a jetways etc. There is a chance for Kiss&fly zone and VIP Terminal in future. The airports concrete runway is 3200m by 45m and can accommodate aircraft as large as Boeing 747 or Boeing 777, albeit not at Maximum Takeoff Weight. Heavy transports such as Antonov An-124 or An-225 have been noticed to land there. The airport uses new generation Instrument Landing System - Thales 420. Runway at Katowice International Airport is the second longest runway in Poland. 33 new stand are under building. They will be located between taxiways E and H, to the west from main apron, between main and cargo apron and to the east from cargo apron. At Katowice International Airport you can find two spotter's platforms. One to the east and one to the west of runway 09/27. It is free and available for everyone who want to take some photos or just see aircraft. Platforms are 2.5m abouve ground. The new ATC is under construction. It will be open at the end of 2018. It is the tallest Air Control Tower in Poland and this part of Europe (46 meters height). A "Moxy by Marriott" hotel has been built recently, and is now ready to accept guests. It is located right next to the main parking entrance (P1), very close to the terminals. A direct bridge connection to the terminals is also planned. There are three main car parks at Katowice International Airport. P1, P2 and P3. P1 is the nearest parking connected direct with terminals. P2 is located to the east to P1. P3 is next to P2 and it is guarded car park. There is a lot of private car parks next to the airport. The airport offers 3922 own parking spaces. There is also Premium Parking at Katowice International Airport. P1 will be expanded to 1842 parking spaces by January 2019. It will be expanded to the west. At the airport you can find two main maintenance buildings. First is serving mainly Wizzair's aircraft, and the modern one belongs to Linetech and serving all other airlines. 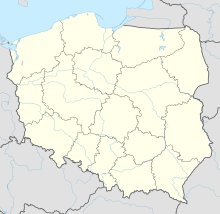 The airport is accessible to/from Katowice and other cities of the region like Częstochowa, Kraków, Opole, Gliwice, Kielce, Oświęcim, Tychy via Expressway S1, national road 86, A4 motorway, national road 94, national road 78 and A1 motorway. The airport is also served by taxis, Uber and iTaxi. The airport offers 3,922 parking spaces. There is also Premium Parking at Katowice International Airport. There are car rentals available at the airport. There is an hourly bus service between Katowice city centre and the airport. The bus leaves from Katowice Main Railway Station and stops near Altus Building, Novotel Katowice and in Sosnowiec (Milowice Shopping Center). It takes approximately 50 minutes to get from center of Katowice to the airport. Bus connections from other largest cities of the region, such as Kraków (about 75 minutes travel), Częstochowa and minibus - inter alia from/to Opole, Wrocław are also available. Local buses connect to the city of Bytom where one can change for bus to Katowice. Since 2018 there are three new bus lines to Airport direct from Katowice, Tychy, Gliwice, Zabrze, Chorzów, Sosnowiec, Będzin, Piekary Śląskie, Siemianowice Śląskie, Mikołów. Bus is leaving airport every 20 minutes. You are able to get to and from the airport to every city in GOP with this ticket (some connections with a free transit). Ride from airport to Katowice City Centre with this bus takes about 1H. You are also able to get from Katowice International Airport to Katowice, Kraków, Częstochowa, Chorzów and Bytom with Flixbus. There is also Matuszek bus corporation. You can get with them from Katowice Airport to Katowice city centre and Kraków city centre. You can ride from the airport to Kraków and Częstochowa with P-Air PyrzowiceEkspres.pl (official WizzAir's carrier). Leo Express can take you to Ostrava, Rybnik, Gliwice and Bohumín direct from the airport. There is currently no passenger rail link to airport but building of a railway between Katowice and the airport is being planned. There will be new railways from Siewierz and Tarnowskie Góry to Katowice International Airport. On 27 October 2007, a Boeing 737-800 chartered by the UN destroyed dozens of approach and landing lights whilst making a low approach. No passengers were injured, but the approach lights were out of service for three weeks. On 12 March 2013, Travel Service Flight 7137, a Boeing 737, overran the runway while landing in snowy weather just before 19:00, its nosewheel getting stuck approximately 3 feet deep into the soft ground 20 metres beyond the runway. None of 176 passengers and 6 crew suffered any injuries, but the airport was closed until 17:00 the next day until the aircraft was recovered and taxied away. On 5 July 2014 Lufthansa Flight 1360, operated by Lufthansa Cityline landed on a new runway under construction. None of the passengers were hurt, and the aircraft later made a technical flight to land on the correct runway, as the runway being built had yet no taxiway connections to apron. ^ a b c d e f g h "Pasazer.com: Blue Panorama zbazuje w Polsce dwie maszyny. Obsłuży rejsy dla Itaki". Pasazer.com. ^ a b "Katowice Airport". Katowice-airport.com. ^ "Statistics from Office of Civil Aviation (ULC)" (PDF). Ulc.gov.pl. ^ "Boeing 747 8 Airport Planning Guide" Archived 5 August 2009 at WebCite, Boeing.com. Link accessed 2007-08-22. ^ "Katowice Airport". Katowice-airport.com. Retrieved 7 June 2015. ^ "Platformy spotterskie w Pyrzowicach - Blog lotniczy Katowice Airport". Blog.katowice-airport.com. ^ "Katowice Airport: Tak wygląda nowa wieża kontroli lotów w Pyrzowicach [ZDJĘCIA]". Slask.eskainfo.pl. ^ Niećko, Dorota. "Hotel Marriott w Pyrzowicach. Hotel Moxy by Marriott na lotnisku w Pyrzowicach ma już dyrektora, choć jest jeszcze w budowie ZDJĘCIA". Dziennikzachodni.pl. ^ "Parking Pyrzowice - na lotnisku Katowice". Katowice-airport.com. ^ "Katowice Airport to expand P! Car Park by January 2019". ^ a b c d "Rozkład lotów - Wielkie Greckie Wakacje - Grecos". Grecos.pl. ^ a b c d e f g h i j k l m n o p q r s t u v w x y z aa ab ac ad ae af ag ah ai aj ak al am an ao ap aq ar as at au av aw ax ay "air and charter tickets". itaka.pl. ^ a b c d e f g h i j k l m n o p q r s t u v w x y z aa ab ac ad ae af ag ah ai aj ak al am an ao ap aq ar as at au av aw "Charter flights". tui.pl. ^ "Bulgaria Air adds new scheduled charter routes in S19". routesonline.com. 28 March 2019. ^ a b c d e f "Coral Travel". coraltravel.pl. ^ "Flights to Antalya". corendonairlines.com. ^ "Ellinair HER-KTW". Ellinair.com. Retrieved 30 September 2018. ^ "Ellinair SKG-KTW". Ellinair.com. Retrieved 30 September 2018. ^ "Online Flights". iaa.gov.il. Retrieved 4 September 2018. ^ a b c d e f g h i j k l m n o p q r s t u v "Charter flights". charterflights.r.pl. Retrieved 4 September 2018. ^ "LOT obsłuży rejsy czarterowe do Turcji dla Neckermanna! - Tanie-Loty.com.pl - Czytelnia". 3 April 2018. ^ 2017, UBM (UK) Ltd. "Lufthansa expands Croatia/Poland routes in S18". RoutesOnline.com. Retrieved 23 December 2017. ^ a b "Network". nouvelair.com. 21 March 2018. ^ a b c d e f g h i j k "Ryanair in Katowice opens the base at the airport in Pyrzowice and 11 new directions to European cities". dziennikzachodni.pl. 15 March 2019. ^ "Taba, Egypt, to resume charter flights in mid-4Q18". ch-aviation.com. 11 October 2018. ^ a b "Route network". Sunexpress.com. ^ a b "Pasazer.com: Wizz Air: Z Katowic do Santander i Alesund". Pasazer.com. ^ "Pasazer.com: Wizz Air: Bergen z Katowic". Pasazer.com. ^ "Pasazer.com: Wizz Air poleci z Katowic do Emiratów Arabskich". Pasazer.com. ^ a b "Wizz Air expands Ukraine network in S18". Routesonline.com. ^ "Wizz Air poleci z Katowic do Kutaisi". Pasazer.com. ^ a b "Wizzair z Katowic do Larnaki i Neapolu". fly4free.pl. ^ "Pasazer.com: Wizz Air: Z Katowic do Liverpoolu". Pasazer.com. ^ a b c d "Pasazer.com: Wizz Air: Cztery nowe kierunki z Katowic". Pasazer.com. ^ "Pasazer.com: Wizz Air poleci z Katowic do Stavanger". Pasazer.com. ^ "Pasazer.com: Wizz Air poleci z Katowic do Tel Awiwu". Pasazer.com. ^ "Pasazer.com: Wizz Air poleci z Katowic na Kanary". Pasazer.com. ^ "Pasazer.com: Wizz Air zainaugurował połączenia z Polski na Sardynie". Pasazer.com. ^ "Wizz Air plans Athens launch in 1Q18". Routesonline.com. ^ "Pasazer.com: Dwie nowe trasy Wizz Aira. Do Włoch i Chorwacji". Pasazer.com. ^ "Pasazer.com: Wizz Air poleci z Katowic na Fuerteventurę". Pasazer.com. ^ "Pasazer.com: Wizz Air poleci z Katowic do Splitu". Pasazer.com. ^ a b c d e f g h i j k "Mapa połączeń cargo". Katowice International Airport (in Polish). ^ Flightradar24. "Live Flight Tracker - Real-Time Flight Tracker Map". Flightradar24. ^ a b Flightradar24. "EI-STN - B734 - Flightradar24". Retrieved 4 March 2018. ^ "Liczbowe podsumowanie 2018 roku - Blog lotniczy Katowice Airport". ^ "KZK GOP - Rozkład jazdy, wyszukiwarka połączeń, linie autobusowe i tramwajowe". rozklady.kzkgop.pl. Retrieved 19 July 2018. ^ "Lotnisko Pyrzowice - e-krakow.com". E-krakow.com. Retrieved 19 July 2018. ^ "Nowe połączenie na lotnisko Katowice". Propertynews.pl. ^ GmbH, MFB MeinFernbus. "Podróż autobusem z Berlin do Monachium dnia 18.07.2018". shop.flixbus.pl. ^ "Tanie bilety autobusowe Katowice od 2 zł - FlixBus". Flixbus.pl. ^ a b c "Katowice Airport". Katowice-airport.com.